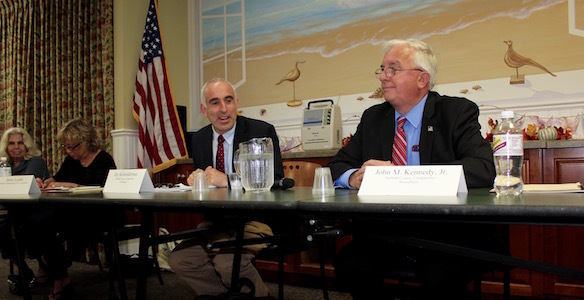 Jay Schneiderman (left) and John M. Kennedy (right) in a September debate sponsored by the Hampton Bays Civic Association. Southampton Town Supervisor Jay Schneiderman, who spent 12 years as a Suffolk County Legislator before he was term-limited out and became Southampton’s supervisor, is seeking this fall to get back to county offices in Hauppauge. Mr. Schneiderman, a Democrat, is seeking to unseat Republican County Comptroller John M. Kennedy this November. If elected to the county post, Mr. Schneiderman’s departure could have a cascading effect on town government. Deputy Town Supervisor Francis Zappone would preside over town meetings, though he would not have a vote on the board, until a special election for supervisor could be held. If a current town board member were to win that special election, the board would then need to decide whether to leave that seat open or hold a second special election to fill it. Mr. Kennedy, also a former Suffolk County Legislator from Nesconset, has been comptroller since 2014. In a congenial late September debate between the two candidates sponsored by the Hampton Bays Civic Association, both candidates agreed that the financial situation facing the county is dire. Mr. Kennedy shared his philosophy of acting as a check on fiscally irresponsible actions taken by the legislature, while Mr. Schneiderman promised a more activist approach toward working with the legislature. But residents in attendence seemed confused about whether Mr. Schneiderman would serve them best as supervisor or as county comptroller. Mr. Schneiderman shrugged his shoulders when asked whether Southampton residents should support his bid. “That’s up to you,” he said. Democratic East Hampton Town Councilman David Lys, who was appointed earlier this year by the all-Democrat board to fill the unexpired term of Peter Van Scoyoc after Mr. Van Scoyoc was elected town supervisor, will face his first bid for election on Nov. 6. His challenger, Manny Vilar, was the Republican candidate for town supervisor in 2017. Mr. Lys, who had previously served on the town zoning board, is a longtime advocate for beach access and spearheaded the effort to preserve the historic Amagansett Lifesaving Station prior to joining the board. Mr. Lys grew up in East Hampton Village, where his mother had a long career as a teacher in the East Hampton School District. He now lives with his family in Springs, where he and his wife, Rachel operate two businesses: Weekend Warriors Tours and Outfitters and East Hampton Physical Therapy. Mr. Lys is a first-generation American whose father immigrated to the U.S. from Indonesia. Mr. Vilar, a lifelong East Hampton resident, is also the son of an immigrant whose father emigrated from Portugal. He is fluent in both Spanish and Portuguese. Mr. Vilar, a State Parks Police Sergeant and vice president of the New York Park Police Sergeants Association, helped to create the Police Benevolent Association of New York State, a union that represents forest rangers, park police, university police and DEC environmental conservation police officers, and frequently travels to Albany to lobby on behalf of the union. He is also a firefighter. Mr. Vilar has focused in his campaign on helping working class people afford to live in East Hampton by providing help for small businesses and workforce housing.